A dramatic weekend’s action ended in Argentina with Martín Palermo’s final match at La Bombonera as Boca Juniors drew 1-1 with Banfield, but although that got more of the headlines and TV coverage, Vélez Sarsfield are the biggest winners of the day. 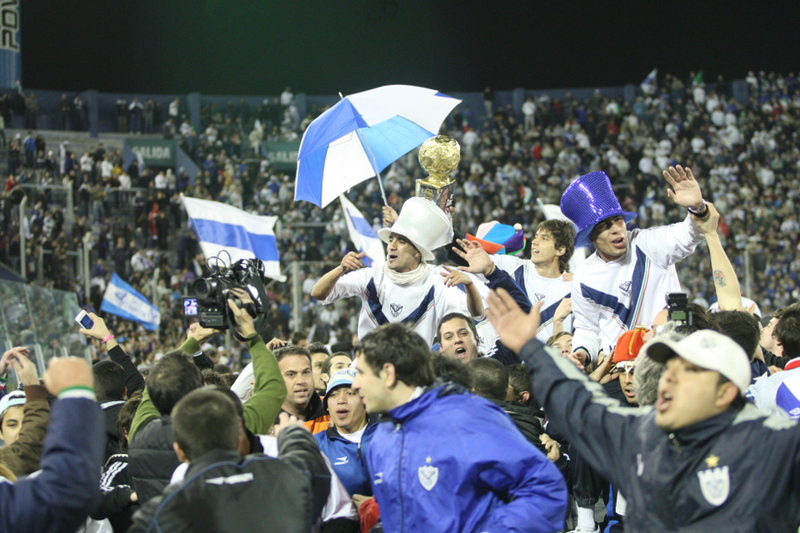 Their 2-0 victory over Huracán and Lanús’ 1-0 loss at home to Argentinos Juniors ensured that Vélez are the champions of the Torneo Clausura 2011 with one game to go. Santiago Silva and David Ramírez got Vélez’s goals, and Nicolás Blandi won them the title by getting Argentinos’ goal against Lanús. Those goals, as well as all the others from a weekend on which everything went right for River Plate in the relegation struggle except, erm, River’s own match, are right here, along with brief details of who’s where in the table. Racing play Godoy Cruz on Monday night. With this draw, Olimpo handed the initiative in the struggle to avoid the higher of the two playoff places back to River Plate. River had previously been relying on other results but Olimpo’s failure to win against Newell’s meant that if River won their two remaining games, they wouldn’t have to play the promoción. This win ensured Arsenal remain in the Primera División for next season, as well as strengthening their claim for a Copa Sudamericana qualification spot. Having announced he’d given up hope the previous week after a 2-2 draw with Boca, Quilmes manager Ricardo Caruso Lombardi suddenly sees his team in with a chance again. This unexpected win over San Lorenzo was the only result that would give Quilmes a chance to reach the lower playoff position and avoid automatic relegation; Gimnasia’s and Huracán’s failures to win later in the weekend ensured that Quilmes will have something to play for on the last day, against River’s and Tigre’s promedio rivals Olimpo. With this win, All Boys secured their place in next season’s Primera División, and helped Quilmes stay in with a shot of overturning Gimnasia in the race to avoid automatic relegation. A point was enough to keep Independiente in the top flight and end worries of the playoff, but it means Tigre still have to be a bit nervous – they’re not quite clear yet. If they draw and Olimpo and River both win next weekend, there’ll be a three-way playoff to decide which side has to go to the promoción. Should the other two win and Tigre lose, Tigre will be in the playoff. This result was the other one which meant Quilmes still have some hope (had Huracán won, they’d have condemned Gimnasia and Quilmes to the automatic drop), and also left Lanús having to win against Argentinos later in the day to stay in the title race. This draw means River are considerably less comfortable than they might have been had they got all three points. River can now stay safe even with a loss; they just have to get the same result as or better than Olimpo. If both lose, River stay up. If both draw, River stay up. If both win, they’ll be level on points average and it then depends on Tigre (should Tigre win there’ll be a playoff between River and Olimpo; should Tigre draw it’ll be a three-way playoff; should Tigre lose they’ll play the playoff). Nicolás Blandi’s goal was celebrated as much in Liniers as in La Paternal; Argentinos’ win meant Lanús can’t catch Vélez now, and Vélez are crowned Argentine champions. This one was the very definition of a dead rubber, but was leant a suitably dramatic twist anyway by the fact that it was Martín Palermo’s final game in La Bombonera. Palermo sadly failed to sign off with a home goal (he’ll get a chance to end his career on a goalscoring note next week when he takes on Gimnasia La Plata, who down the years have been the team he’s scored most against), as Nicolás Colazo scored Boca’s opener, which was cancelled out by Facundo Ferreyra. There was a tearful good bye afterwards during which Palermo was given the goal at La Doce’s end of the pitch as a parting present. I’ve included the video of Palermo’s farewell speech for those of you who understand Spanish. An over the top farewell at the Bombonera for Palermo. Once they put the cape on him I thought they were going to hoist him up with cable and fly him around the Bombonera with blue and yellow smoke coming out of his fundament. A nearly, or maybe definitely, bizarre send off. Made even stranger for this observer by Palermo’s mentioning of Estudiantes. If you are celebrating your 25th wedding anniversary you don’t tell your second wife that, “I really liked my first wife, but I like you more”.